If you’re a turkey hunter in May, it’s not uncommon to feel like you’re finished. Not finished turkey hunting, just finished in general: a heap of impotence and an empty freezer where the venison is getting thinned and there’s no wild bird to supplement. Your turkey tags remain unfilled. Ugh. But May is May, dude. There’s opportunity there for turkey hunters yet. Instead of late-season turkey hunting symbolizing something fleeting, this time of year can mark the moment when male turkeys find themselves abandoned. It’s lonely out there, boys and girls! Hunting this biological cycle can be a nuanced affair that requires a different set of tactics, but it’s one that serves the observant and calculating turkey hunter well. The end of the laying period marks the beginning of incubation. This is when the boys get lonely. it's over for them, but this stage is also what some biologists and outdoor writers call turkey hunting's second season. The hens, however, aren't lonely. They’re in danger. Sitting like targets, day and night, for 28 days on their nests. Image courtesy of the NWTF. Be mindful of nature's calendar, not the human calendar. At the beginning of the spring hunting season, hunters should be targeting hot gobblers occupied with breeding and courtship. The breeding period is triggered by longer periods of daylight in spring and, in response to this seasonal shift, there is a subsequent hormonal response. Each state wildlife agency works to set a hunting season that corresponds with nature and the state's weather patterns, but unusually warm weather or cold snaps can play havoc to a hunting season based, in part, on the calendar. Yet nature's spring season is fluid, changing with the whims of the weather, and mildly indifferent to the calendar. Given the relatively short hunting seasons for wild turkeys, this can make a big difference. So while May is typically considered late-season turkey hunting, a series of cold snaps can change that, stretching the breeding season out or; conversely, if March and April are unusually mild, late-season turkey patterns can come early. With that in mind, play the averages while staying mindful of your home state's unique weather patterns and adjust your strategy accordingly. This applies not just to in-season turkey hunting, but also it's good to note how the weather impacts winter feeding and reproduction prior to hunting season. Bonus Fact: In their first two weeks of life, 56 to 73 percent of wild turkey poults die. Most of these mortalities are due to predation when the small birds are not yet able to roost in trees. Respond. At least, that’s the idea. And often, the idea is in fact a reality. Turkey hunters, even those who call badly, find themselves no longer competing with the real thing making their stilted, bad yelps and clucks sound a lot more reasonable and realistic to a now desperate tom. Also don’t forget that in nature a hen responds to a male bird’s gobbles differently than a turkey hunter does. Once the male bird has indicated his position by responding with a call, the hen will call in response and come, advancing toward her prospective mate. So, already, the human turkey hunter is banking on what's not natural: that the gobbler will be so hot and aggressive he’ll come all the way in to the hunter's setup, oblivious that this poser's lack of movement is a bit odd for a legit hen looking to breed. The chances of this working goes up when the competition is down. 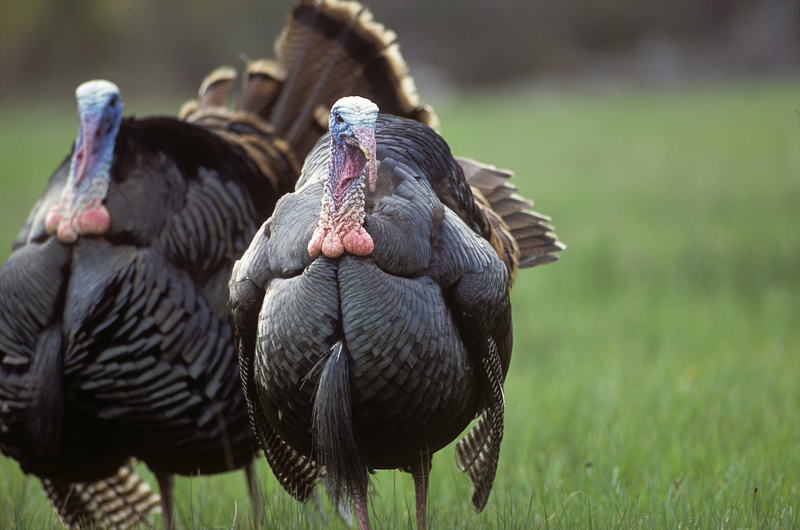 Another advantage of late-season turkey hunting is fewer interceptions. Let’s say the gobbler is indeed hot and he's talking and he’s coming for you, regardless of the plethora of hens on the ground. He's seemingly locked in, vibrating the woods, gobbling loud and often with real abandon. But, in the end, it's all for nothing. You spit your mouth call out on the ground, it lands in dry, late-March leaves. You lean your head against the tree you've been sitting against and look up at the clouds. Why? Because some hussy chimed in and she was in the valley between you and the bird. Distance was her advantage. She intercepted your guy. When late is too late. If weather patterns or other factors outside of your control made spring come early, you may find yourself in the May woods hunting gobblers that are no longer in their breeding cycle. At that point, the males will start roaming with other gobblers and they’ll stay in all-males groups through summer and fall. In this case, approach a late-season turkey hunt like you might a fall turkey hunt. When calling, try soft-selling gobbler yelps. It’s a deeper and slower cadence, described nicely here in a late-season turkey feature posted by Realtree.com. This article also offers a series of tips on what you should be listening for when a gobbler is no longer vocal. Slim pickings. It’s true that abandoned toms in late spring can make for a successful turkey hunt, possible even more ripe with opportunity than early spring. Yet it’s also true that the woods have been hunted for weeks and there is a numbers game at play. It doesn't work to the advantage of late-season hunters. Watch out for the sassy ones. There’s a Proverb about this sort of female. She’s already coupled up with a tom, but out she comes again, scouting the woods for another gobbler. This isn’t unusual behavior for young hens getting off to a late start, or undernourished hens who won’t breed until (or if) they’re in optimal health. Or sometimes things go south with the first clutch of eggs, which has hens off the nest and out looking again to start a second, late-season clutch. Ghost town. Maybe public ground isn't exactly a ghost town during late-season turkey hunting, but the woods will be notably less crowded. By May, there are fewer turkey hunters thanks to guys who have filled their tags or simply given up and packed it in. Eastern Wild Turkey. Breeding usually begins in late February or early March in its southernmost habitats, but not until April in northern states. The cycle is complete with the hatching of poults by June or as late as mid-summer farther north. Birds that renest may bring off broods as late as August. Florida (Osceola) Wild Turkey. The reproductive cycle for the Florida wild turkey begins only slightly earlier than the eastern wild turkey in other southern states. However, in southern Florida, turkeys gobble during warm spells in January, several weeks before actual mating. Egg laying is mainly in March and April with peak hatching occurring in early May. Rio Grande Wild Turkey. Mating activities for the Rio Grande starts in March and nesting activity is high near the end of April. With the incubation period of 28 days, most poults are present in the last week of May or early June. Merriam’s Wild Turkey. Some Merriam’s migrate from the foothills of the Rocky Mountains to higher elevations in the summer for breeding and nesting and return to winter in the lower elevations. Movement distances vary but more than 40 miles movements are not unusual. Movements may differ annually and geographically, depending on snow conditions. Movements from wintering areas occur between mid-March and mid-April. Gould’s Wild Turkey. Gobbling activity for the Gould’s has been documented to begin in April and May in Mexico and from late April into June in New Mexico and in Mexico. The Gould’s turkey has been studied the least and, as a result, has the smallest amount of information available about it.